The KIA Sportage is no less than any legendary premium crossover in the segment and has a very beastly design. Plus, the subtle visual tweaks that the company has done for the 2019 model manages to take the treat higher. The tiger nose front grille is slightly changed and gets a glossy black touch. Apart from this, there is a major change in the mechanism as well. The existing engine, 1.7-litre CRDi has been replaced with the newer 1.6-litre U3 diesel. It will come in two states of tunes, one making 113 PS and the other having 134 PS of power. Have a question on Sportage? Sportage is available in 10 different colors - Inferno Red, Sand Track, Planet Blue, Aurora Black Pearl, Sparkling Silver, Alchemy Green, Casa White, Sirius Silver, Bronze Metal and Deluxe White. Watch latest video reviews of KIA Sportage to know about its interiors, exteriors, performance, mileage and more. First introduced in 1993 as an urban SUV concept, the Kia Sportage has now become one of the best-selling SUVs across the globe. The sheer success of the SUV can be determined by the whopping sales figure of 5 million units till date. The hot-seller has been also awarded the iF Product Design Award in 2016. However, the manufacturer took a little long to introduce it in the local market and launched Sportage in 2016. The fourth-generation of the SUV is equipped with modern features, a new sequential shift automatic transmission and number of mechanical enhancements. So, let's find out what the current Sportage has to offer in various aspects. Once you have stepped inside the KIA Sportage, things turn out to be more attractive than what the exterior design promised. Every bit of the placement seems to be so neat and well-thought-of. Right behind the steering wheel, there is a 4.2-inch TFT LCD colour screen, which is accompanied by two analogue dials - the speedo and tacho. The centre AC vents sit on either side of the 5-inch LCD touchscreen display along with buttons and knobs. The three-spoke steering has a lot of control buttons for the music system and calling feature. The front windscreen has an automatic defogger, which comes in handy during winters and also during extremely hot weather. The panoramic sunroof is bigger than usual and extends up to the rear seat row. The seats are quite comfortable and are shod in good quality upholstery. There are ample leg and shoulder room for a comfortable ride. And though the cargo space is big, thanks to the increased length, the foldable rear seats make the boot space humongous. 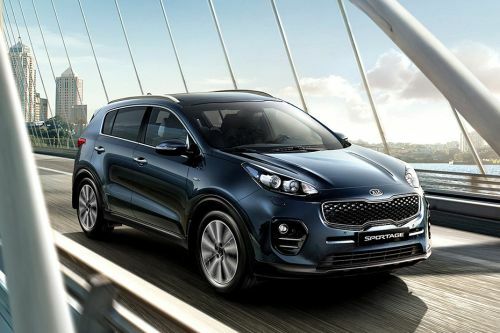 The updated model of the KIA Sportage is sporty and futuristic. It can be called as a new urban SUV owing to the kind of design it exhibits and is very much in-line with its naming. The front profile is highlighted by a unique mesh grille and sleek swept back headlamps. Moreover, the Xenon headlamps are offered with LED DRLs. Getting to the designing, every corner and edge of the crossover has been crafted to be aerodynamic, including the lower bumper as well where the clusters beneath the fog lamps are hollow, just to help the smooth flow of the wind. The wheel arches get a thin strip of black cladding, which stretches to the lower skirt of the car. The rear split tail light clusters get LED units on them and they extend almost till the C-pillar. And to make things sportier, there is a dual tone exhaust with chrome embellished tips. The window line gets a thin strip of chrome all around, while sleek roof rails and a shark fin antenna add to its sportiness. And yes, the skid plates at both ends prove that it is designed to take on the uneven roads as well. The buyers can opt for the base 17-inch alloy wheels as well as the top of the line 18-inch or 19-inch alloy units. The KIA Sportage is a powerful SUV when it comes to the performance. The engine under the hood is just as thundering as its aggressive design. The compact SUV is offered in three different engine trims. The smaller engine is a Nu 2.0-litre D-CVVT petrol motor which is capable of churning out a maximum power of 152 hp along with a peak torque of 192 Nm. However, the R 2.0 VGT diesel engine is more powerful, producing 182 hp power and 383 Nm of torque at 4000 rpm. The biggest engine is a 2.4-litre petrol unit which makes a humongous power of 175 hp along with a peak torque of 226 Nm at 4000 revolutions per minute. The KIA Sportage is a reliable vehicle when it comes to delivering performance on the road. The aerodynamics has been improved a lot, which helps in delivering it a better performance and fuel efficiency. When it comes to the safety features, the KIA Sportage ranks pretty high. There are some edge-cutting technologies used that make the driving more stable. To begin with, there is a feature called ATCC (Advanced Traction Cornering Control), which analyses the road bends and makes cornering pleasant and smooth. And guess what, gone are the days when the handbrake lever occupied a good amount of space at the front. The Sportage has a small switch near the gear knob, which activates parking brakes. The SUV is built with Advanced High Strength Steel on a rigid chassis in the hot-stamping process, which makes it one of the safest cars to be in. Inside, there are as many as six airbags, which are strategically placed all around the car so that the driver and occupants are safe in an unforeseen accident. To make things easy for the driver, there are three drive modes on offer - Normal, Eco and Sport. However, that is not everything. The sensors given on the sides and rear monitor if there are any car nearing yours. Under such circumstances, visual alerts are transmitted through the ORVMs. The Automatic Cruise Control is set to maintain a stable speed throughout the journey. If the driver wishes to disengage this setup, he/she just needs to apply the brakes or accelerator. What is the price of KIA Sportage? On road prices of KIA Sportage in starts from AED73,500 for base variant 1.6L Base(FWD), while the top spec variant 2.4L Top(AWD) costs at AED113,500 . What are the colors options available in KIA Sportage? Kia Sportage – Is it worth your money?